This is a smart web acceleration technology for larger sites. Edgemesh won’t be right for everyone, but it has lots of potential. 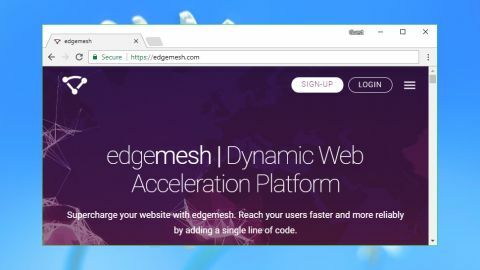 Edgemesh is an interesting web acceleration technology which provides a simple and speedy way to accelerate your website performance. Unlike content delivery networks (CDNs), which rely solely on an expensive network of data centers, Edgemesh works as a client-side platform. Once you're set up, visitors to your site automatically become part of the Smart Mesh network and can transmit data peer-to-peer. Initially the service works with images and video only. That's enough to make a real difference to most users, but users with an Enterprise account can tweak the system to add more file types. Busy websites should see immediate benefits from Edgemesh. If most of your visitors come from one region, they'll be able to share data between themselves rather than directing all their requests to a single point of presence. Performance should improve as data won't have as far to travel, and the load is shared between everyone rather than being placed on a single server. The service optimizes speeds further by employing client-side compression to reduce the amount of data it's moving, and then replicating what's left by transferring content via the ultra-low latency WebRTC, rather than HTTP. Edgemesh automatically scales with demand, too. If something on your site goes viral and you have a million more visitors next Tuesday, no problem – that also means you have many more clients to share the load. While this sounds great, there's an obvious problem with the core principle: Edgemesh works by taking the bandwidth from some of your visitors to accelerate site loading for the others, initially without asking for permission. This won't be very much and in the long run everyone benefits, but it's easy to imagine how some visitors will hate the whole idea and complain about you ‘stealing’ their bandwidth. If you think this might be an issue, Edgemesh suggests displaying an initial warning message highlighting what's happening, and giving users a chance to opt out. Exactly how and when to do this is up to you, but the Edgemesh site has more on the concept and there's an example opt-out message at the bottom of that page. Edgemesh is available through three main plans. The no-strings free Edgemesh Professional gives you Smart Mesh acceleration and detailed reports on user metrics. Low mesh priority means reduced acceleration, and there's 'community support' only, whatever that means (we didn't see a forum or any other sign of a 'community'). Still, it's a quick and hassle-free way to get started with the service. Upgrading to Edgemesh Business for $99 (£76) a month brings higher mesh priority and email, chat and phone support. Integrated image optimization can further improve speeds, and there are options to set custom geographic and asset policies. Enterprise customers get maximum mesh priority, a dedicated support engineer and even more options to fine-control and customize the service for their own needs. There's no fixed price, though – you must talk to the company about your needs and they'll give you a quote. The website doesn't make much effort to explain most of this. You might be curious what 'Image Optimization' might give you, for instance, but there's no link or explanation on the page or anywhere else we could find on the Edgemesh site. Still, it seems unfair to complain when you're getting the bulk of Edgemesh for free, and we weren't going to let the basic documentation and other website quirks put us off signing up. To get started with Edgemesh you must first create an account. The signup form doesn't ask for much information – name, email address, company name – and after verifying the email address our account was immediately activated and ready for use. The Edgemesh control panel is stripped-back and simple, with no hassles or complexities to get in the way. We quickly found the Add Origin button because, well, there was nothing else, so we clicked it and entered the domain we wanted to accelerate. An installation page explained the two remaining steps: add the Edgemesh Service Worker script to the root of our web server, and reference a second script from the <head> element of our index.html. Clicking a Verify button should confirm the connection, or raise an alert if there are any problems (Edgemesh can only serve data over HTTPS, for instance). Once the service was apparently working, we tested it by repeatedly revisiting our target site in various browsers. Clicking the User Metrics page in the Edgemesh control panel displays simple reports on enabled sites – visitors, page views, load times and more – and sure enough, summaries of our visits were recorded and listed almost immediately. Well, that's the idea. It didn't work when we tried it, and we played around for a while with no success. The documentation doesn't have enough depth to be helpful, and although tech support is included with commercial subscriptions, non-experts stuck with the free plan's 'community support' could quickly run into trouble. This may not matter very much – it's just a testing procedure, and if Edgemesh is running okay you may never have to use it – but it did leave us wondering how difficult troubleshooting Edgemesh issues might be for free users. There's no easy way to figure out the speed gains you might see from Edgemesh, as there are so many variables to consider: the website assets that could be cached, the location where the site is hosted, the numbers, locations and geographical spread of your visitors and the times they access the site. Edgemesh reports an outstanding example where one client apparently saw over half a terabyte of traffic offloaded from its origin servers, and its mean page load time fell by a third. To fully benefit from Edgemesh you'll need to be running a large and busy site, of course, but overall the company clearly has a lot to offer. Just keep in mind that the technology is still in its very early days, and you may need to spend some time experimenting before you find out whether this is the right web acceleration platform for you. Edgemesh is a promising technology which could deliver a major speed increase for large and busy websites. It's very hard to say whether this might apply to you, but the free plan makes it relatively easy to play around and find out for yourself.